As I have been using PowerPoint a fair bit recently, I noticed a template for Microsoft Office Mix. 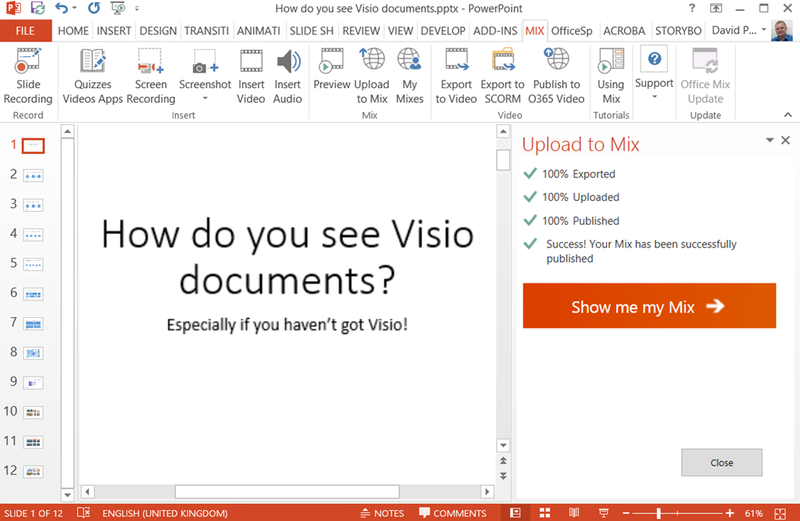 It lead me to install a free PowerPoint add-in that enables me to add optional audio and video to the presentation before uploading to the Mix website ( see https://mix.office.com/ ). At first, I didn’t realise that my voice was being recorded, so I did it again … but maybe I should keep my mouth shut! Personal views on Dynamics 365 for Operations and Technical Architecture. Life with Visio and other Microsoft Toys! Every so often (too often in the IT industry) I encounter things that should have been very easy to do but turned out to be far too complicated. My favorite topics include SharePoint, .Net development, and software architecture, especially distributed systems.